611 Exquis A complex mushroom coloured base that is shot through with copper and gold shimmer. 221 Or Divin A full bodied gold shimmer on a sheer pale gold base. It takes a few coats for opacity and is notably brighter than a lot of gold hues. 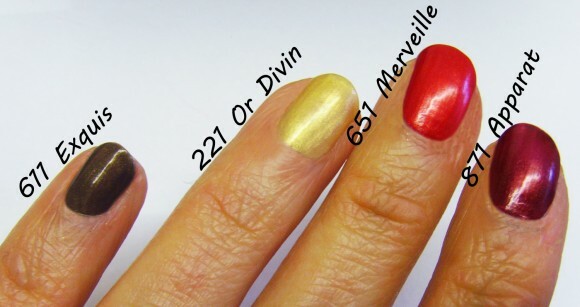 651 Merveille A bright and beautiful red that leans towards the pink end of the spectrum in some lights. Shot through with golden shimmer. 871 Apparat A festive burgundy hue with gold undertones and gold shimmer. This one’s almost two-tone. Close up of the swatches - look at that shine! 217 Or Etoile This sheer shade is infused with pale golden micro glitter. It can be worn alone or layered on up of another shade to add a metallic dimension. 451 Cinderella This petal shade offers the perfect flush of pink for lips. With a hint of shimmer and a lovely sheen, it’s the easiest shade of the bunch to wear. 527 Versailles This rosy ‘my lips but better’ shade is deceptively complex. It leans a little towards the brown end of the spectrum and is quite warm. 747 Victorine Victorine is a muted orange red with a golden sheen. If you’re looking for a red and you’re of a fairer tone, this may be the one for you. 758 Constellation This warm coral pink hue offers a pop of brightness without being too overpowering. It has a golden sheen with a subtle pink shimmer. 841 Belle de Nuit This full-bodied hue is an ideal way to wear red. It doesn’t lean too warm or too cool, and the golden shimmer makes for a lovely added extra. 961 Nocturne This is an incredibly beautiful raspberry red colour with lots of micro-fine golden shimmer. Of all of the colours, this one is my favourite for the Christmas season. Again another great nail polish from Dior. Long lasting and great colour and shine. Easy to apply. This entry was posted on Tuesday, November 1st, 2011 at 11:06 am and is filed under Make-up, New products, Swatches, Tried & Tested. You can follow any responses to this entry through the RSS 2.0 feed. You can skip to the end and leave a response. Pinging is currently not allowed.